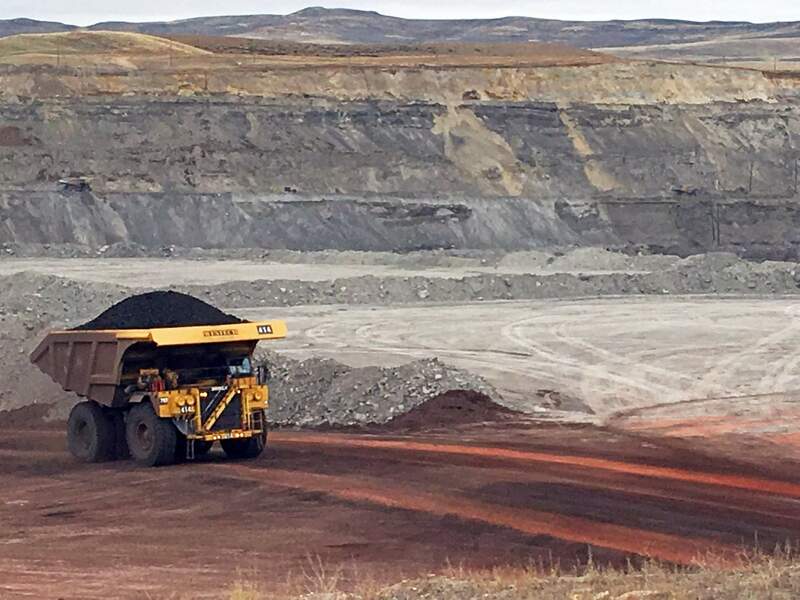 A dump truck hauls coal at Contura Energy’s Eagle Butte Mine near Gillette, Wyo., in March 2017. A conservation group wants a federal judge to disband a Trump administration energy advisory panel that is reviewing royalty payments made by companies that extract fuel from public lands. BILLINGS, Mont. – Conservationists claimed in a lawsuit filed Tuesday that a Trump administration committee reviewing royalties paid by companies on fossil fuels extracted from public lands is stacked with industry supporters who conduct some meetings in secret. The Western Organization of Resource Councils asked a federal judge in Montana to disband the U.S. Interior Department’s Royalty Policy Committee and strike down its recommendations. The 20-person panel – comprised of representatives from industry, state government, tribes and academia – was established last year by U.S. Interior Secretary Ryan Zinke. It’s supposed to find ways to remove barriers to drilling and mining, while making sure taxpayers aren’t shortchanged by energy companies. Zinke in April rejected the committee’s recommendation to lower royalty rates for offshore . Critics allege the panel has made one-sided recommendations that favor industry and weaken environmental protections. Those include calls to speed up oil and gas lease sales in the Arctic, hasten approvals for new drilling and allow coal companies to largely self-determine the value of fuel they sell on the export market. “It’s basically the fox guarding the hen house,” said Steve Charter, a rancher from Roundup, Montana and board member of the Western Organization of Resource Councils. Soon after forming the committee last year, Zinke lifted a moratorium on coal sales from public lands. The moratorium was imposed under President Barack Obama because of concerns over climate change and to investigate if coal companies were skirting royalty rules with their exports to Asia. The royalty committee has held at least four public meetings since last September. Tuesday’s lawsuit alleges subcommittees from the panel have met privately, with no public notice, to craft their recommendations. Zinke spokeswoman Heather Swift declined to comment directly on the lawsuit or the allegations of secret subcommittee meetings. She said it was “inaccurate” to suggest the committee was dominated by industry. “It’s not even a majority industry. Further, for the first time ever the committee includes representatives from renewable energy,” Swift said. Six of the committee’s primary members come from the energy industry. Six are from energy-producing states – including Wyoming, Texas and Alaska – and four represent American Indian reservations with significant fossil fuel reserves. The remaining four members are from universities and the firm Wood Mackenzie, which does consulting and research for the energy and mining industries. University of Colorado Law School professor Mark Squillace, who has pushed for years to re-examine federal energy royalty rates, sought to serve on the committee but was not selected by Zinke. He said its unsuccessful recommendation to lower royalty rates for offshore oil and gas drilling, from 18.75 percent to 12.5 percent, showed the panel’s bias toward industry. The 18.75 percent rate was set during the administration of President George W. Bush. In rejecting the panel’s recommendation for a reduction, Zinke said higher energy prices and other factors meant drilling wouldn’t slow if his agency maintained the higher rate. “This committee does not seem willing to acknowledge the importance of maximizing federal revenue from mineral properties,” Squillace said.